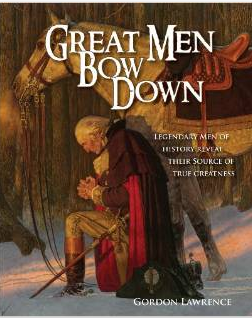 The subtitle of the book “Great Men Bow Down” by Gordon Lawrence is “Legendary Men of History Reveal Their Source of True Greatness.” In this book Lawrence has gathered quotes, testimonies and short bios that illustrate the strong value systems of great men throughout the ages that are based on Judeo-Christian beliefs in the God of the Bible. The format of the book is very readable and can easily be used as a devotional. On each facing page there is a short biography or testimony from the life of a great man, a quote from the Bible, then on the facing page a collection of quotes on a topic such as the Bible, wisdom, Character, etc. Among many other Christian values there are many great quotes on the subject of prayer, forgiveness and the book can be used for meditation. At the end of the book the author has added a section entitled “What You Believe and How You Pray.” This departs from the format of quotes by giving two informative chapters. The first is “Backbone of the Believer” that covers the seven primary doctrinal beliefs of Christianity. The second is entitled “Reporting for Duty” and is an outline for prayer from Genesis 1:28.
Review: I was immediately drawn to this book by the picture of George Washington kneeling in prayer at Valley Forge along with the strong title. Gordon Lawrence told us that he was the first person who had asked permission to use this incredible painting on a book cover. This book is well laid out and is absolutely filled with gems of wisdom. In the introduction Lawrence explains that the men he quotes were far from perfect yet they are included because of the way they lived and expressed godly values. It is clear that Lawrence loves both history and good quotations, and it is a gift to us all that he has taken the time to gather these for us. Some of the quotes may surprise you and cause you to want to learn more about these great men. He includes ministers and theologians in this book along with scholars, military leaders, literary giants, sports heroes, famous businessmen, musicians and doctors. The chapter he includes with an outline for prayer is a fresh approach to the kind of things we pray. He gives us an outline with 8 topics, such as “We pray to honor God, we pray for blessing, we pray for obedience” etc. He gives a prayer using each of these in two sentences, then offers a one page discourse on each topic. This book also includes a very thorough appendix in the back that includes topical table of contents, a list of subject quotes, a list of poems and prose, Scriptural references, a list of the men quoted by vocation, etc. This is one of those books that you’ll want to keep near your reading chair so you can revisit it often. It would also make a wonderful gift for a great man you know.